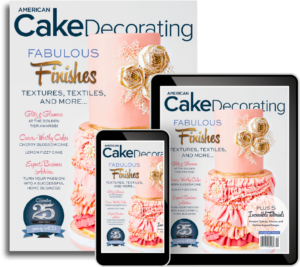 This week American Cake Decorating magazine launched the Out of The Box Cake Challenge: A choose-your-own-adventure wedding-cake challenge, hosted and curated by American Cake Decorating magazine. TEN lucky cake designers will be selected to receive a special mystery box filled with a range of different cake-decorating supplies to be incorporated into a beautiful wedding-cake design. The winning designer will receive a coveted cover feature, a $1,000 cash prize, and an extensive prize package of cake goodies. We answer some of your most frequently asked questions about the competition. 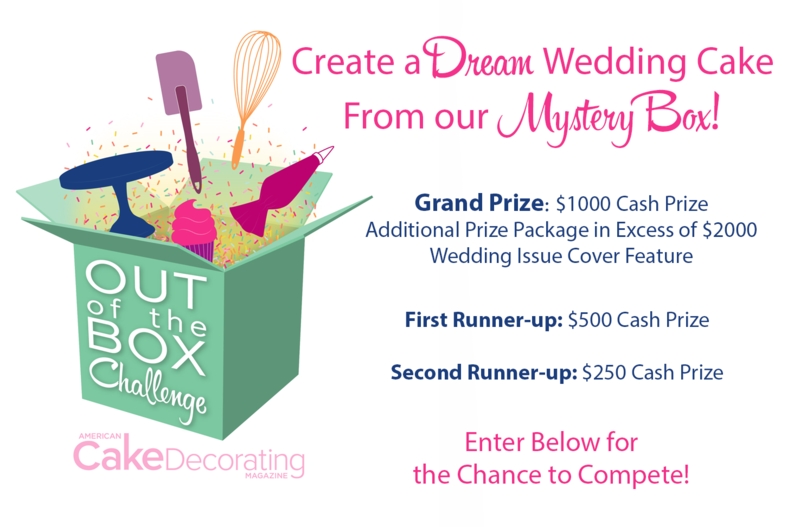 The Out of The Box Challenge is open to all cake artists both domestic and international. However, any artists who apply must be able to fulfill the requirements of the competition. Do I have to use all the products supplied? can I substitute my own brand of fondant? Yes, You have to use some of each of the products in the box and you must use the brands provided by our sponsors. Any substitution of products will result in your exclusion from the competition. Our judges should be able to identify the products used on the finished design. Participants may provide a written description of the cake to show where and how products have been used. Yes and No, every mystery box will contain a written description of an imaginary mystery couple for which the cake must be designed. The description will specify season, color schemes, important design information about the venue and the couple, and the number of servings required. Like in a real-life situation, cake artists will be required to meet the brief, whilst also demonstrating their flair and imagination. Do I need to use real cake? No, participants may use cake dummies as one might for a competition entry, however no parts of the dummy should be visible. How long should the tutorial be? Tutorials should be short (10-20 steps) and they should focus on one of the elements in the mystery box. Tutorials should be discussed with the editorial team for approval before commencing. When are the cakes/materials due for submission? Cakes must be completed and photographed, and all materials must be received by no later than May 6, 2019. Failure to meet the deadline will result in disqualification from the contest. Participants will have 4-5 weeks to complete their project and tutorial after receiving materials. We feel this is sufficient time to meet our editorial and print deadlines. If you are selected as a finalist, you will receive your box within 5 working days. All box materials will be mailed by American Cake Decorating to qualified participants. Boxes will be sent via FedEx or UPS. Can I participate if I cannot provide high-resolution images? No, Any participants who receive a box must commit to providing our team with professional quality high-resolution images, without these images we cannot feature your work in print and you will be disqualified from the contest. Who decides who will receive a box? Our in-house editorial team and our judging panel (which consists of select sponsors) will decide who will progress in the competition and receive a box. The contest is designed to be as unbiased and as fair as possible. Contestants should demonstrate their ability and style by submitting 10 photographs from their portfolio along with a biography and reason for participating. Contestants will be selected based upon the strength of their portfolio and application. All 10 finalists will have their cakes made up into a mock cover, which will be posted online for a public vote. The winning cover will be the cover that receives the most votes. Votes and IP addresses will be monitored to ensure fair voting practices are employed throughout the competition. When will I know that I have won? What happens if I don’t hear anything? Don’t worry, if you have filled out the submission form, we have received your entry and we are reviewing the information. Unfortunately, due to the sheer number of entrants, we can’t respond to everyone, however if you are selected, you will hear from our team within a week of the competition closing date. I want to participate but I am concerned I may not make the deadline. Should I enter? You should only enter the competition if you can commit with 100% certainty to the project. 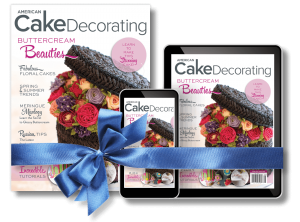 American Cake Decorating is relying on participants to honor their commitment, as our entire issue is depending on the content from the competition, as well as our sponsors, who have generously donated both product and prize money. If you cannot meet the requirements of the competition, you should notify us immediately or withdraw prior to receiving a box. If I am selected as a finalist, will my work appear in print? Yes, ALL 10 finalists will be featured in the July print issue of the magazine!